After you launch your financing activities, work to improve your processes, and start to see positive results, it’s time to capture these successes and share them with external stakeholders. Sharing successes showcases the impacts of the work of your staff, partners, and other key stakeholders, and can contribute to the development of a self-sustaining marketplace for energy efficiency lending by proving that home energy lending is beneficial for all involved (i.e., homeowners, lenders, and contractors). Financing activity results from your program’s impact evaluation are good information to communicate, but you should also plan to develop and share examples, stories, lessons learned, best practices, etc., that highlight financing successes to demonstrate the viability and value of energy efficiency lending. Channels and products for communication. Collect examples, stories, lessons learned, best practices, and data trends that highlight financing successes. Communicate program impacts with your lending partners. As part of your program’s strategy for communicating impacts, you will want to identify financing successes to share with external stakeholders, as well as program-wide successes to share with your lending partners. The following two steps can help you communicate the impacts of your financing activities. As you deliver your program and maintain communication with homeowners and your lending and contractor partners, plan to identify examples, stories, lessons learned, and best practices that highlight the successes of your program’s financing activities. These successes can be communicated to audiences such as program funders, homeowners, potential lending and contractor partners, secondary investors, and the media to demonstrate the positive impact your program is making, the viability and profitability of home energy lending, and the value of home energy lending as a tool to drive uptake of home energy upgrades. Homeowners who were able to convert their interest in home energy upgrades into actual completion because of the affordable financing offered. Homeowners who were initially only interested in air sealing their home, but due to affordable financing also decided to upgrade their refrigerator, washer/dryer, and HVAC system, resulting in deeper energy savings. Contractors who are able to process paperwork quickly so that approvals happen the same day. Lenders who experienced low initial approval rates for home energy loans using traditional underwriting criteria, but then saw increases in approval rates (with low default rates) when switching to alternative underwriting criteria (e.g., utility bill payment history). How your program saw increases in loan uptake by ensuring that contractors could explain financing options to homeowners with simple messages focused on long-term value, low monthly payments, low interest rates, enhanced home comfort, and energy savings. You can collect successes through surveys of homeowners and regular meetings with your lending and contractor partners, discussed in the Financing – Assess & Improve Processes handbook. Your program should encourage open, informal, and ongoing input from your lender and contractor partners to help collect successes. All examples, stories, lessons learned, and best practices should be passed on to the person in your program responsible for implementing your communication strategy. Use positive trends in your program’s financing metrics, tracked through implementation of your financing evaluation plan and overall evaluation plan to highlight the success of your financing activities to external stakeholders. Downward trends and areas of improvement are also important to look out for and should be resolved while working with your lending and contractor partners to assess and improve processes. Decreases in loan payment defaults. Work with your lending partners and evaluation team to collect these positive data trends, and pass them on to your program’s communication team to incorporate into outreach material. Efficiency Maine administers a number of energy-saving programs to promote the efficient and cost-effective use of energy by Maine homeowners. Through Efficiency Maine, the Home Energy Savings Program offers a variety of energy loans to help homeowners pay for energy upgrades, including Efficiency Maine Energy Loans, Property Assessed Clean Energy (PACE) loans, and FHA PowerSaver loans. 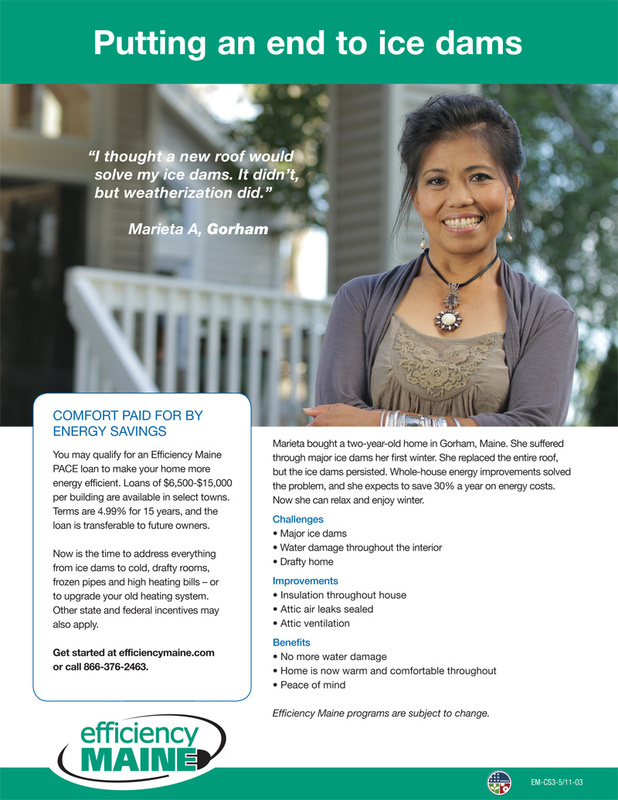 Efficiency Maine publishes annual reports, and showcases homeowner case studies on their website that highlight successes made possible through energy efficiency financing. The 2012 Year in Review highlights the story of how one couple used a home energy loan from Efficiency Maine to make their home more comfortable and save an expected 40% on their energy costs. The case study of a homeowner illustrates how she was able to finance home energy upgrades that will save her 30% a year in energy bills. More case studies are also available on Efficiency Maine's website. 203 loans issued, totaling $2.5 million, through Efficiency Maine’s PACE and PowerSaver Loan Program (129 PACE loans, 25 secured PowerSaver loans, and 49 unsecured PowerSaver loans). Average loan amounts of $12,730 for PACE loans, $21,349 for secured PowerSaver loans, $6,528 for unsecured PowerSaver loans. Verified first-year, annual gross savings for the PACE and PowerSaver Loan Program for fiscal year 2013: 10,445 million British thermal units (MMBtu), or an average of 54.4 MMBtu per project. Through your ongoing interactions with lending partners, plan to share positive financing data trends with them as well as homeowner success stories related to financing and program-wide impacts. Communicating your successes will demonstrate the positive impact your program is making in your community and how your lending partners are contributing to that impact. Demonstrating the viability and profitability of home energy lending will also strengthen confidence in it among your current lending partners, potential lending partners, and secondary investors, helping to create a sustainable market for home energy lending. Greater quantity and quality of upgrade projects completed. Community Power Works in Seattle, Washington, partners with two lenders to provide low-interest loans: local nonprofit community lender Craft3 and Puget Sound Cooperative Credit Union. Community Power Works’ website prominently highlights homeowner stories that detail how affordable financing offered by the program’s lending partners help to make upgrades possible. For example, one such story explains how one customer upgraded her old, inefficient furnace with a new, efficient model, saving her family $200 a month on their energy bill. The high upfront cost of the furnace replacement threatened to put the upgrade out of Susie’s reach, but through a low-interest, Craft3 loan she was able to complete the upgrade. Successful programs use many channels to communicate accomplishments and results to stakeholders. These include word of mouth and products such as press releases, announcements on websites, case studies, and presentations. Many programs use earned media—especially local media when possible—by giving people something to talk about, such as endorsements from local personalities. New Orleans’ NOLA WISE program (Worthwhile Investments Save Energy) organized showcases hosted by homeowners. NOLA WISE promoted these showcases through neighborhood canvassing, electronic newsletters, social media, and collaboration with nearby neighborhood associations. The events often generated earned media coverage. NOLA WISE experienced an uptick in home energy assessment requests in neighborhoods where these events were held following the showcases. At the Energize Bedford launch event, Martha Stewart—one of Bedford’s best-known citizens—was a prominent attendee and supporter. Reaching well beyond the immediate community, Martha Stewart wrote about her experience on her blog, further illuminating the important work of Energize Bedford. Locally well-known people can be effective program champions as well, such as a local weather person. The Solar and Energy Loan Fund in St. Lucie County, Florida actively attracted media coverage by continuously refreshing its message, maintaining a sense of new activity and innovation, and stressing its contribution to the community. The program emphasized “firsts” in its messaging—such as its first loan, its first experience with crowd funding, and launching the county’s first PACE financing program. It emphasized key funding or participation milestones (e.g., $2 million in loans issued).The program also highlighted the success of its partners and the satisfaction of clients, in addition to its own accomplishments. These activities kept the program continuously in the news. Ivy Knoll Senior Retirement Community used PACE financing to make significant building improvements of systems that were outdated or energy inefficient. Through PACE financing, Ivy Knoll management was able to select improvements that had the highest energy savings but also came with higher upfront costs for the 7-story, all-electric building. Outlines Philadelphia's EnergyWorks program's use of low-interest loans to incentivize homeowners by tying the interest rate to the number of energy efficiency measures incorporated into the home. Discusses innovative financing options designed to expand the accessibility of energy efficiency financing to households that typically do not qualify for traditional loans. This case study presents information about the AlabamaWISE program. It includes background information, approaches the program took to enhance home energy efficiency, and results achieved by the program.